Snapchat isn’t just for sharing disappearing photos anymore, it’s a platform which more and more people turn to for their daily entertainment and news fix. By combining silly with serious, Snapchat offers a unique user experience, and you can be a part of it! 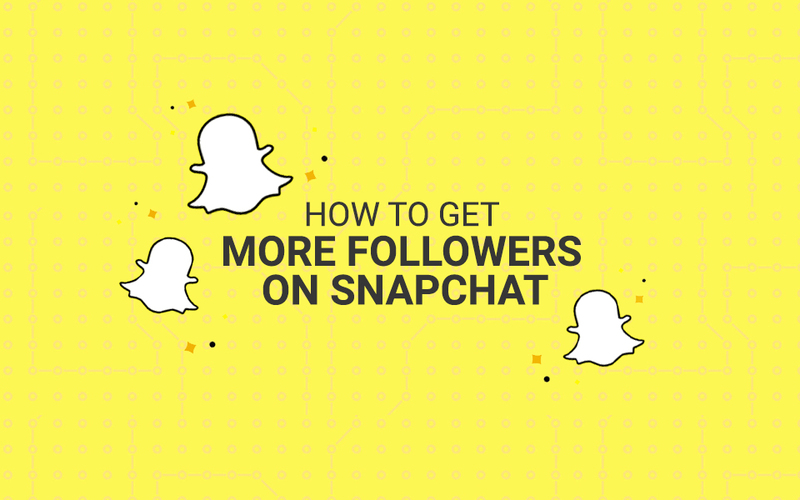 Our tips will give you a good base to grow your following from, so let’s jump in and optimise your Snapchat usage. To make it sound profound and way more complicated than it actually is: “People can’t follow you if you’re not on a path.” Simply put, if you’re not on Snapchat, and you’re not posting daily, then you can’t hope to build a consistently growing and loyal audience. Now, before we go any further, we’re not saying that the way to grow a large Snapchat audience is to endlessly spam the platform, you need to have a planned content strategy. For example, if you’re trying to expand a fitness brand’s audience, then posting pictures and videos of uninspiring, unhealthy breakfasts is unlikely to get you the attention you’re after. (possible step 0.5) If you’re reading this before ever setting up a Snapchat account then run a test phase with a small group of your friends, make sure you’re happy with the standard of the content you’re posting before trying to gain a celebrity level of followers. We’ve all taken a photo that we think will look great but really looks amateur at best when posted alongside the rest of our content, try to ensure it doesn’t happen to you. Most of all, you should be consistent with what and how often you’re posting. Having random days where you post 6 updates on your story and then three days with no posts isn’t going to help you grow that loyal audience you’re striving for! At best, it will gain you some immediate attention and follows, but these will quickly be lost if you’re not engaging, responding and always, always developing further. Snapchat, wonderful and far reaching though it is, isn’t enough by itself. It’s highly likely you’re already on Facebook, Twitter, Instagram etc. so leverage these existing networks! Though not everyone who engages with your work on one platform will also view it on another, there is a great deal of crossover. Snapchat is great for short bursts of storytelling, vlogging and brand tracking, but for blog posts (or anything else you have to read that’s longer than about 10 words) Snapchat isn’t the place. So make sure that your audience is able to connect with all of your content forms and come across something new. Making sure that you have links to your Snapchat from Facebook and vice versa will help you to organically grow your audience, and if you have to take a break from posting longer articles on LinkedIn or anywhere else, you can always encourage your followers to stay up to date during the break through your Snapchat account. In the early days of Snapchat, the platform was designed to create tight knit communities, now less so. But the old route of people being suggested through their phone number still works, so when you’re out and about networking if you come across any potential clients or sponsors, get that number! Snapchat accounts are still tied to phone numbers, so it will suggest that you follow their stories, and that they follow yours. Doing this means you’re subtly introducing them to your content without pushing it directly to them, and they can track your progress and fall in love with your brand that way. Whether it’s snapping back and forth with your long distance best friend or commenting on other people’s stories, it’s important to be engaging with other people and their work on Snapchat. This is because the more you interact with others and contribute to the platform the more Snapchat points you’ll accrue. Snapchat points all go in towards a score which you can view on your profile, the more points you have, the more trophies you unlock, and the more secret features you gain access to! Beyond this, the more you engage with other people’s content and respond to comments on your content, the more they’ll be enticed to engage with yours. Remember: hundreds, thousands, or even hundreds of thousands of people could be watching one story, but the number of comments might only be 10% of the number of views. So by actively engaging, you stand out from up to 90% of other people who are only passively engaging with it. The more you interact with other people’s work, the more curious they’ll be about you and your content, and curiosity will only help you build your legions of followers. Even if you’re the face of your brand, and your brand is a makeup company, posting endless selfies with your product isn’t going to be enough to grow that massive following you’re after. When your stories become predictable, they stop being exciting, so add the occasional unexpected post. Because Snapchat stories only last for 24 hours you have more freedom to add new and quirky elements to your story without it being part of your branding long term. That isn’t to say that you have free reign to post badly thought out content, you never know what will go viral, be conscientious about what you’re putting out, always. Varying your content allows you to appeal to a wider variety of people and potential customers. This isn’t to say that if you had an amazing photo shoot one day then you can never share more than 1 photo from it, instead, wait at least 2 weeks before recycling content, this stops it feeling familiar and redundant. Snapchat has more than the dog ears filter that everyone knows about, there are geotagged filters, interactive 3D stickers and so much more to play with. Don’t be afraid to play and have fun with it, Snapchat isn’t an overly serious platform, the experience for ALL users is meant to be fun. Stickers and filters allow you to showcase your own personality, humanising your brand, and the more fun and engaging your content, the more likely people are to share it with their own audiences! You might find that using just one or two of these tips is enough for you to start seeing results, so implement these gradually and find out what works best for you. And remember, have fun with it! Looking to advertise on Snapchat? Look no further than our Guide to Snapchat Advertising for top tips.